subgenus Strobus (Lemmon), section Parrya (Mayr), subsection Rzedowskiae (Carvajal); one from a "primitive" group of piñon pines. 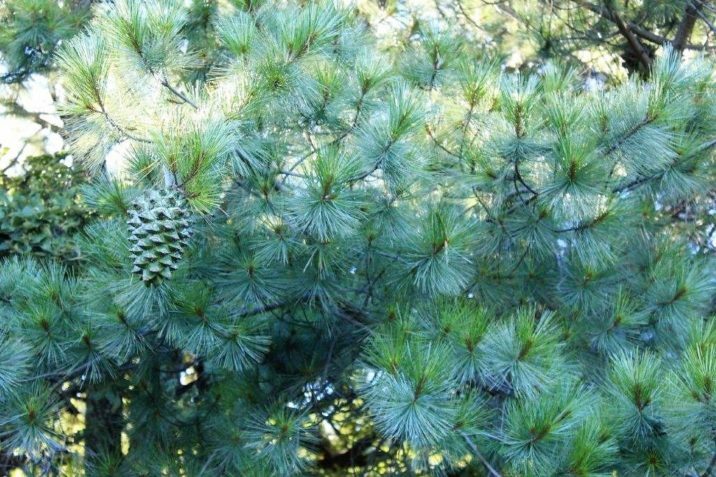 Pinus maximartinezii, first described in 1964 by Jerzy Rzedowski (born 1926), is commonly known as big-cone piñon pine or Martínez piñon; as well as maxipiñon in the Spanish language. The species name honors Maximino Martínez (1888 - 1964), who greatly advanced the study of Mexican conifers, describing many new species and varieties, not all of which have stood the test of time. Ethnobotany. The species was discovered when Mexican botanist Jerzy Rzedowski found its exceptionally large and highly edible seeds for sale in a local market. There is probably still some local use of the seeds as food, but local workers now get an income for collecting the mature cones, for taking the seeds from the cones and for cutting bushes around the piñones to prevent a possible fire from ascending into their crowns. The seeds are no longer used for food but for propagation for reforestation programs. The trees are no longer cut for firewood. The trees in the Durango population are also used as a source of seed for food, although as in Zacatecas, this may change as the local people become more aware of the trees' rarity and value. Description. 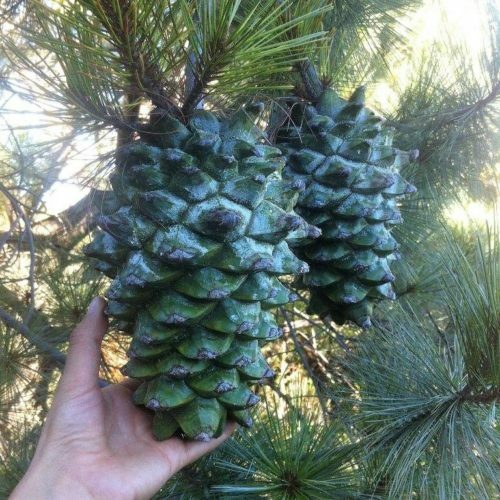 Big-cone piñon pine is an evergreen, coniferous species of tree that grows to mature heights of 52 feet (16 m) with a trunk up to 24 inches (40 cm) in diameter, measured at breast height; and a broad crown with irregular branching. Bark is smooth; pale grey at first, becoming thinly scaly grey-brown on mature trees. Leaves are Blue-green in color, borne in fascicles of 5, sheath mostly deciduous but the small basal sheath scales persisting. Each needle measures 2.4 to 4.8 inches (6 - 12 cm) long by about 0.032 to 0.04 inch (0.8 - 1 mm) thick, with white stomatal bands on the inner faces and a glossy green outer face. Pollen cones are 0.32 to 0.4 inch (8 - 10 mm) long, colored pale, yellowish brown. Seed cones are huge, massive, and pendulous on surprisingly slender peduncles 0.4 to 1.2 inches (1 - 3 cm) long and only 0.24 to 0.32 inch (6 - 8 mm) thick. They are oval-cylindric in shape, 5.6 to 9.2 inches (14 - 23 cm) long by 4 to 4.8 inches (10 - 12 cm) broad, green in color at first, ripening pale brown and opening to 4.4 to 5.6 inches (11 - 14 cm) broad; weighing up to 4.5 pounds (2 kg) when green. Cones mature in August, about 27-28 months after pollination, an unusually long period. Seed scales are massive, 1.4 to 2 inches (35 - 50 mm) broad, and 0.8 inch (20 mm) thick. Apophyses are pyramidal, with an unarmed knoblike 0.4 to 0.6 inch (10 - 15 mm) wide umbo. Seeds are very large, at 0.88 to 1.04 inches (22 - 26 mm) long, they are the largest of any pine. Seeds are colored orange-buff, with a vestigial wing, 0.04 to 0.08 inch (1 - 2 mm) long that remains attached to the scale when seed is removed. Seeds do not fall naturally from cone, but are dispersed by birds. Distribution. This species is native to Mexico — Durango and Zacatecas. The Zacatecas site was the species' only known locality from its discovery in 1964, until 2010, when a second population was discovered in extreme south Durango. In southern Zacatecas, the species is found from circa 8 miles (12 km) southwest to a few miles west Juchipila. It is found in scattered stands across an area of about 3 to 6 square miles (5 - 10 km²) on ridges and east-facing slopes of the Sierra de Morones, growing in montane dry forest at elevations of 6,200 to 7,200 feet (1,900 - 2,200 m) above sea level. These trees represent a single population, numbering approximately 2,000 to 2,500 mature individuals in an area of 400 hectares; thus its status as an endangered species. 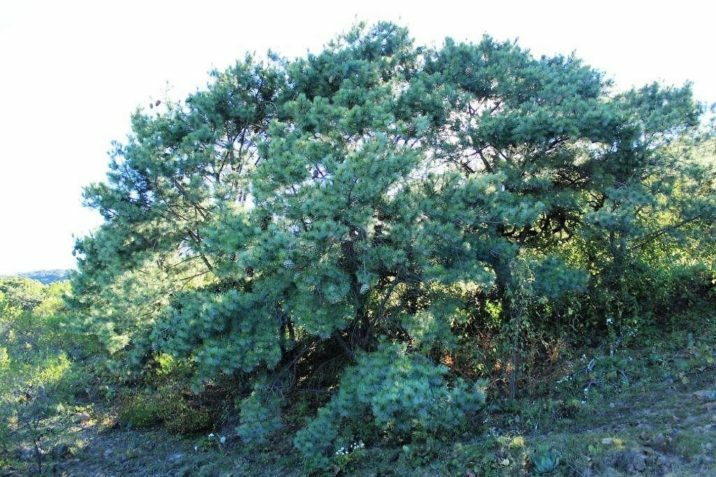 However, it is actively being protected while contributing to the local economy (as described below), with the result that "all locals I encountered in the field have one aim: the conservation of Pinus maximartinezii. Attribution from: Ronald M. Lanner; The piñon pine; ©1981, University of Nevada Press, Reno. 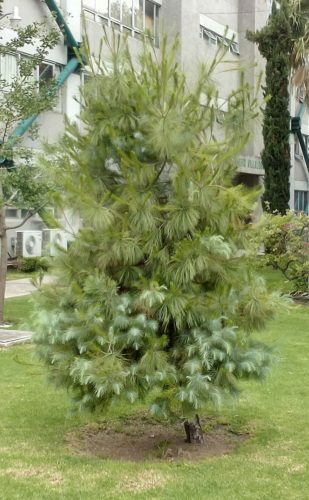 Pinus maximartinezii — young trees will often display a combination of juvenile and adult foliage. 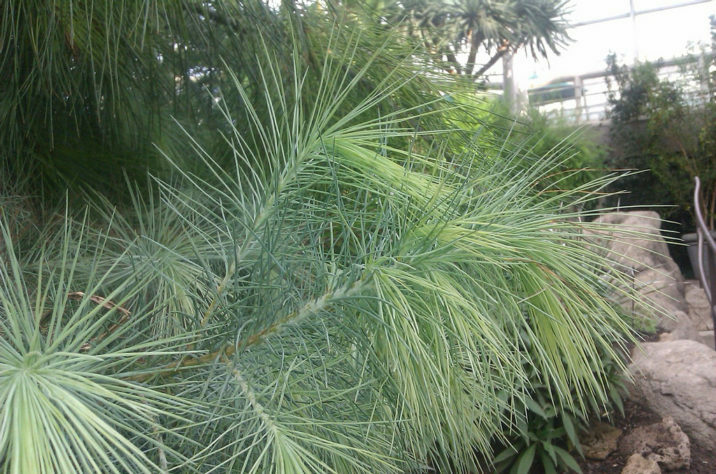 Pinus maximartinezii — juvenile foliage detail.